This super-easy stovetop-to-oven frittata seems almost fancy, so it’s great for entertaining because you can customize it any way you like! 1. PREHEAT oven to 400°F. Beat eggs and cream cheese with a wire whisk until it’s well blended. Set aside for now. 2. SPRAY a 10-inch ovenproof nonstick skillet with cooking spray. Add the red and green peppers to the skillet and cook and stir for 2 min. or until they’re crisp-tender. 3. ADD bacon, 3/4 cup of the shredded cheese and the cilantro to the egg mixture; stir it all up until it’s well blended. Add this mixture to the ingredients in the skillet; stir. 4. COVER skillet with a lid. Reduce heat to low and cook for 6 to 8 min. or until the egg mixture is almost set in the center. Remove lid. 6. 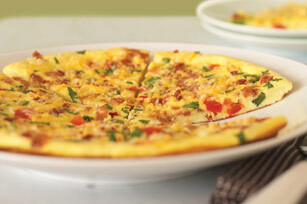 LOOSEN frittata from side of skillet with spatula and slide onto serving plate. Cut into wedges to serve. Makes 6 servings, 1 wedge each. KEEPING IT SAFE: If you don’t have a skillet with an oven-proof handle, you can make it oven-proof by wrapping the handle with aluminum foil before placing in the oven.